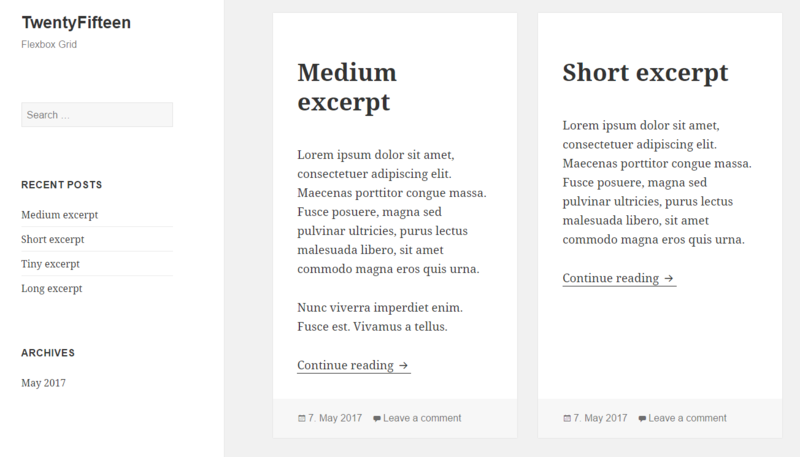 A friend asked me on how to show the home page with the latest blog posts as a grid instead of a list. I though a bit about how I would solve it and as I haven’t used CSS Flexbox a lot in the past, I wanted to try this out. So, on the train back to Berlin, I tinkered a bit and came up with a small solution. I needed a theme to experiment with and again I’ve chosen TwentyFifteen, as if has enough pace to have a grid home page. So, how does the home page look like in the theme by default? The post posts are a list of article tags, each with a margin to the sides to make the spacing and a top margin (not visible here) for the gap between the individual posts. We want to convert this into a simple grid with two columns. But there is still an issue. 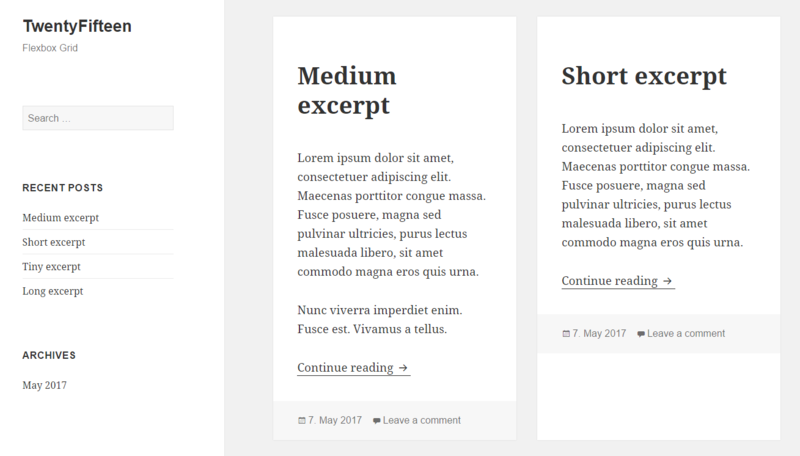 If some post excerpts are shorter than others, the article tag will have the same height, but the article footer will not be at the bottom. Flexbox items can be aligned on two axes. 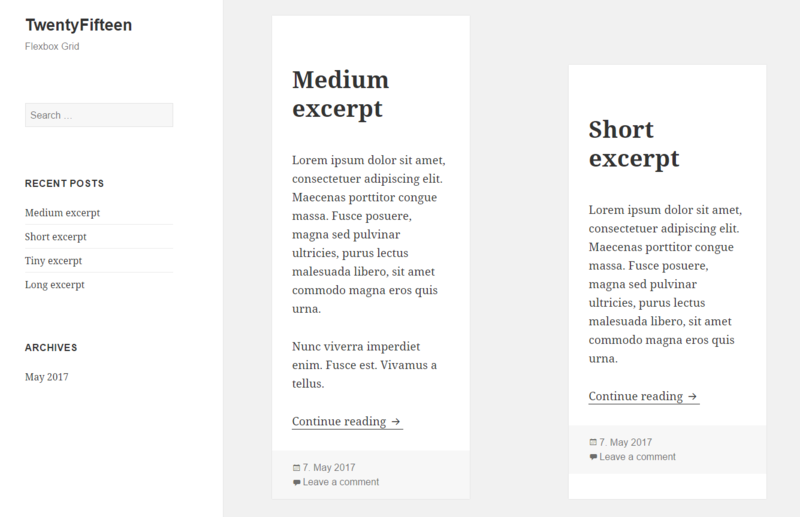 Within the article tag, we align the items on the column, rather than the row (which is the default direction used in the first flexbox). Now any property set will affect the vertical alignment. 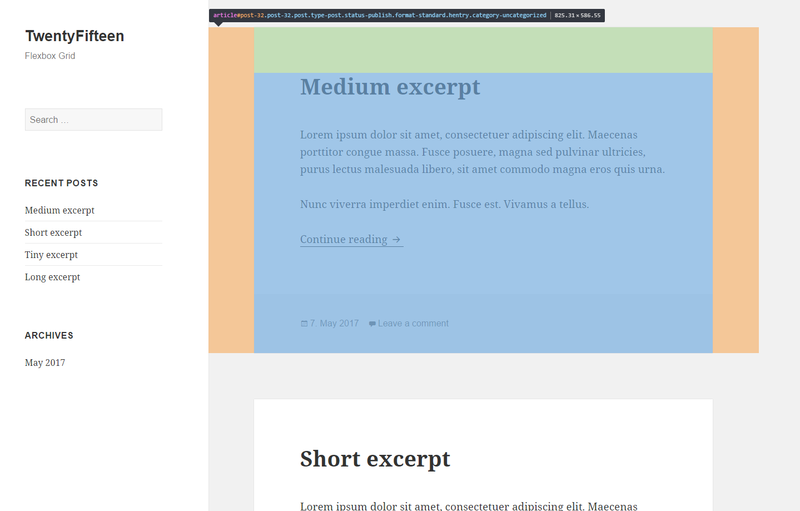 To position the footer at the bottom of the article tag, we simple have to set the top margin to auto. You can find a theme with the example in a GIST. It can probably be improved a bit here and there, but I think the basic idea should be clear. I would really like to experiment a bit more with flexbox. Maybe I can find an easy solution for a masonry layout of the home page using flexbox. Or do you have found such a solution already? If so, please leave a comment.